In what felt like a laughably heroic effort, we ventured OFF PENINSULA for a Saturday night adventure to South Portland last weekend. We went all the way over the bridge, guys. I kid. But as my friends one-by-one become homeowners, I occasionally have to make the concession to visit the Portland suburbs or South Portland. It's like a 10-1 ratio of their Portland visits to my suburb visits. As avid bowlers, my friends and I were eager to check out Easy Day, a new bowling alley on Broadway in South Portland. The lanes are easy to find - just turn right after the bridge and they're immediately on your right. The parking looks tight, but there is a free valet service. The former event hall (and before that Beale Street BBQ) has been renovated beautifully, something that will surely help it shake its reputation of being a cursed space. 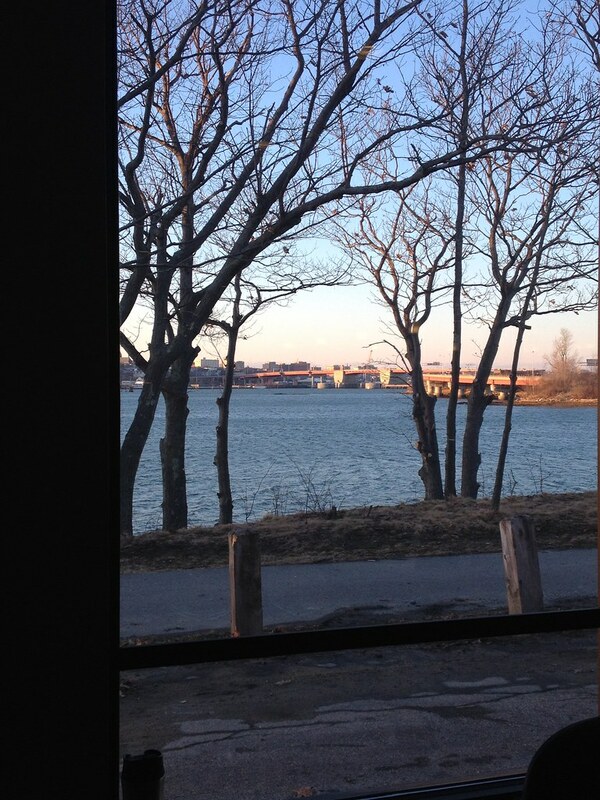 Floor-to-ceiling windows face the Fore river, letting in lots of natural light and providing a rare view of Portland and the Casco Bay bridge. The lanes are owned by former Navy SEAL and Pat's Pizza owner. The name "Easy Day" comes from the Navy SEAL motto "the only easy day was yesterday," and the bar is decorated with photos of SEALs in training. The pizza part comes in a different form than at Pat's, served Detroit-style, which looks similar to Sicilian-style. I saw one go by, and it was square, thick, and delicious looking. I had wings ($7.99 for 6) which unfortunately, did not wow me. 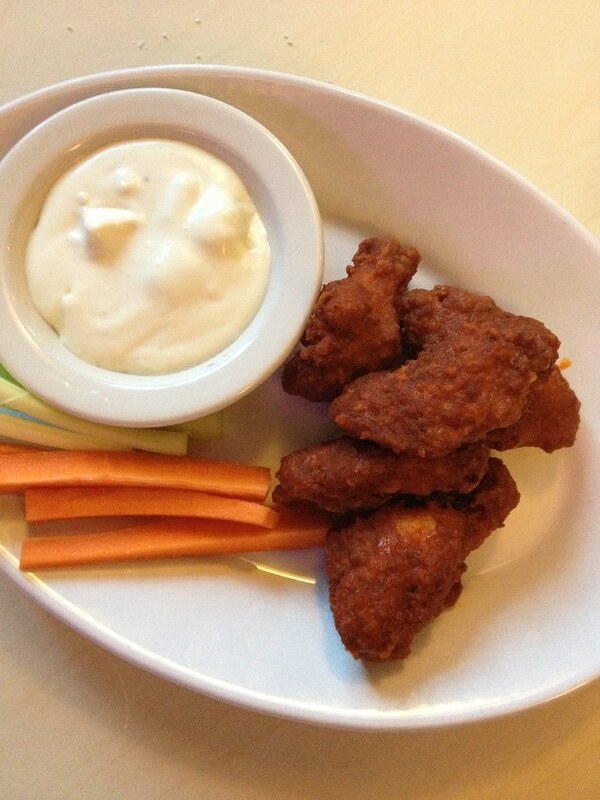 They had great flavor, but were served lukewarm and with too much breading. Also without napkins... kind of a deal breaker for eating and bowling. I asked for napkins, then went to the bar, and then eventually got my own paper towels from the restroom. Which alludes to the subpar service... I don't want to hammer them too hard, since they were slammed while we were there from 6-8pm on a Saturday night. Our server was very sweet and they have a call button on the lanes - like the flight attendant button on an airplane - a great feature. For the record, while I love Bayside Bowl, I am open to all bowling experiences. I do not want this to come across that I went in with biases and had them confirmed. The bowling alley is very new and very popular and so, good for them. 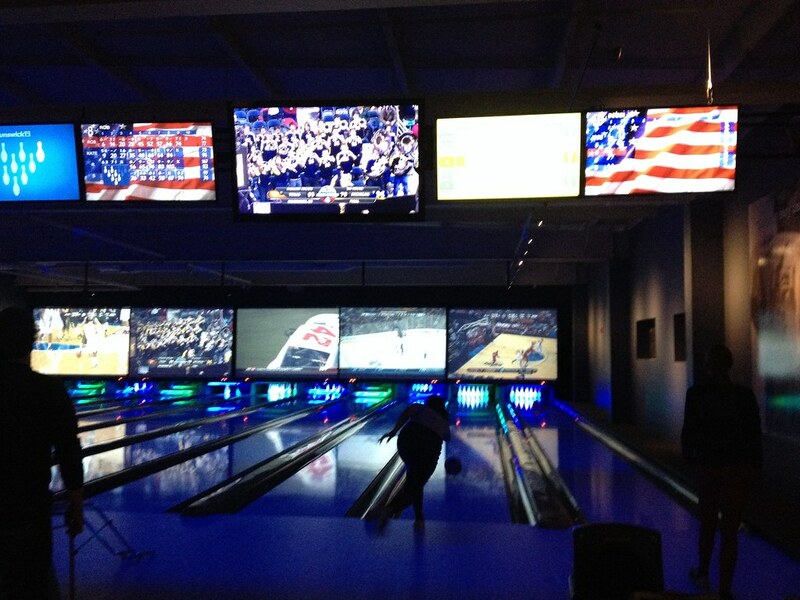 But as someone who enjoys bowling, I found the experience to be a little overwhelming. The lanes are very crowded - of course with people, but with furniture too. It's difficult to navigate between the couch and tables on your way to the lane. That said, with only a few people, this setup would be very comfortable, like if you had lanes in your living room. Anyway, we hurried out and decided to get a pizza and retire to a friend's house. 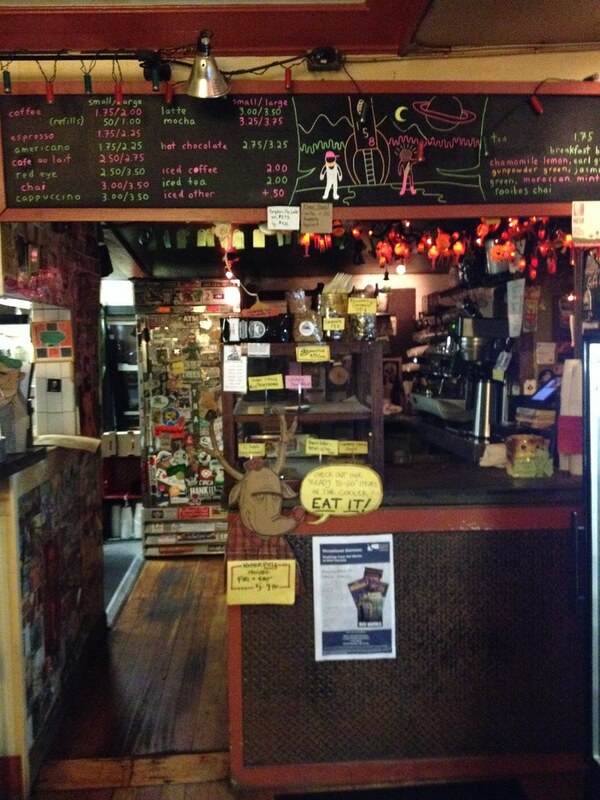 I've long since wanted to try 158 Pickett Street Cafe's pizza, offered only on weekend nights until 9PM. We got the last two pies at around 8:30PM. We ordered the Stinger - one pie I've been wanting to try ever since they started serving pizza. 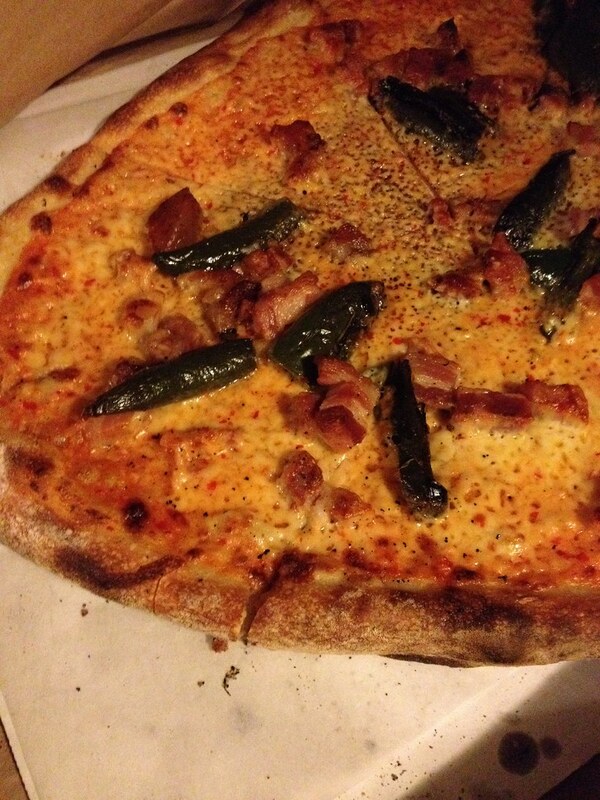 It's a pink sauce, with cheese and charred jalapenos ($11). I added pancetta (+ $1.50). LBK ordered the veggie special, with scallions and red peppers. But unfortunately, I wasn't blown away by these pizzas. And it pains me, pains me, to say this, because 158 Pickett Street is a) run by super nice people and b) home to the world's best salmon bagel. The problem was that the pies were too greasy. The crust is nice and thin, creating a floppy slice, but also allowing for the grease from the cheese to soak through quickly. The jalapenos added no discernible heat (OK, not the cook's fault) and the pancetta was very fatty, further contributing to the grease overload. Sorry, hastily shot. I know better than to get in between people and their pizza! I don't know if our evening was doomed from the start? (I will not make that a connection to South Portland.) But unfortunately, I didn't find a SoPo experience worth repeating during this adventure. 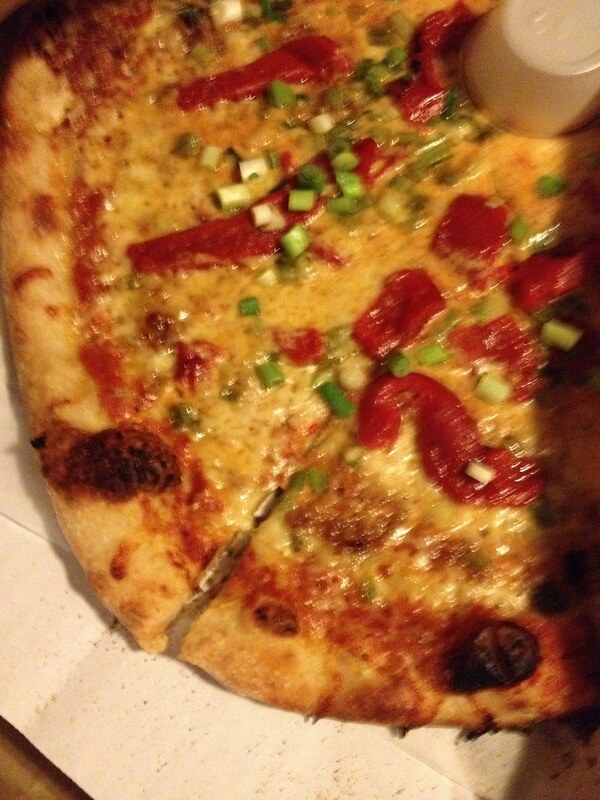 But I do believe you should go check out Easy Day bowling alley and try 158's pizza for yourself. My opinion is just that, and you may find your next neighborhood favorite.